Erin Danielson (née Chambers) is Rita Barksdale's daughter. She makes her only appearance in the series in episode "I Don't", but is involved in off-screen adventures twice in Series 5. 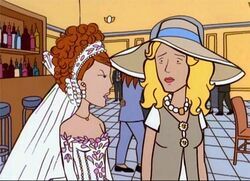 Erin is the only daughter of Rita Barksdale and the only cousin of Daria and Quinn Morgendorffer on their mother's side of the family. She's twenty-one years old in "I Don't", and twenty-four in "Aunt Nauseum". Erin let's loose on what she thinks of Paul (and Rita). 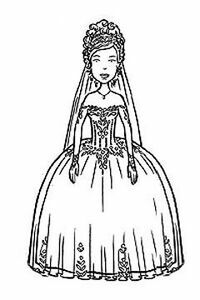 Eric makes her only appearance in "I Don't", where she marries Brian Danielson. 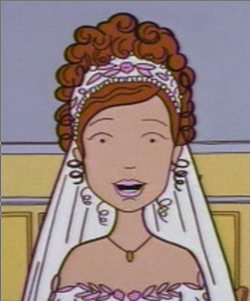 In the episode she was shown doting on her fiancee and attempting to keep the peace between her mother and her aunt. She also showed contempt for Paul Meyerson, her mother's then boyfriend, and an irritation with her mother & her dates ("you know exactly what's going on here, mother"); she also showed a friendly attitude towards Daria (who dislikes Erin). This page was last edited on 18 June 2013, at 14:40.